Please join us for our future Nutcracker performances, a family favorite holiday tradition, presented by Laguna Ballet. Laguna Ballet is a non-profit junior ballet company founded by Shery Gilbert, and is comprised of students ages 5 and up. 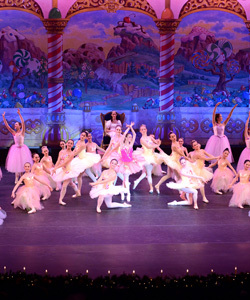 For the past 32 years, over 90 children from Orange County participate each year in Laguna Ballet's full length Nutcracker ballet. Participants in the production are given the opportunity to dance with professional guest artists from companies such as New York City Ballet, San Francisco Ballet, American Ballet Theatre, Moscow Classical Ballet, and Joffrey Ballet. Auditions are required for all participants.